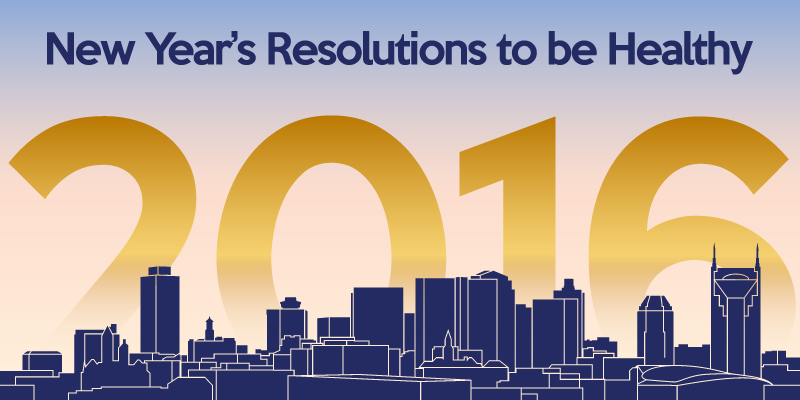 Have you decided on your 2016 New Year’s resolutions yet? Maybe you want to go to the gym more or eat healthier. Those are both excellent resolutions—no matter the time of year—but many New Year’s resolutions are abandoned pretty quickly. In fact, British psychologist Richard Wiseman found that only 12 percent of people he tracked accomplished their goals. If you want to achieve your 2016 New Year’s resolutions to be healthy, try some of these helpful tips. Don’t overload your resolution list. The new year is a great time to make positive changes to your life, but if you resolve to change too much, you could be setting yourself up for failure. Try tackling one or two goals this year. We recommend getting to the chiropractor more. Be specific. A lot of New Year’s resolutions fail because the goals are too vague. How do you measure the success of “go to the gym more” or “eat healthy”? Instead, try getting to the gym once a week or eating two freshly prepared meals each week. Get even more specific by determining how long you’ll spend at the gym and what you’ll accomplish there. Track your progress. Piggybacking off of the previous tip, make sure to measure your success. You’ll be disappointed after struggling with a new resolution if you don’t feel accomplished. Additionally, you can adjust your goals throughout the year based on your results. If you reach your goals too easily, up the ante. On the other hand, if you’re having trouble hitting your target, you may have been a little too ambitious and need to lower your expectations in order to set yourself up for success. Get accountability. In other words, tell someone what you hope to accomplish. Sheer willpower alone will often lead to failure. Ask a friend or family member to check on your progress, and offer to do the same for them. Take 10,000 steps each day. This sounds like a daunting task, but even a sedentary person typically takes about 3,000 steps in a day. Keep a pedometer with you to track your success; a lot of smartphones have built-in pedometers and can count steps while in your pocket. There are also many fitness wristbands, like UP24 or Fitbit, that can count your steps throughout the day, as well as measure heart rate, track nutritional and sleep habits, and even send information to your smartphone. Try parking farther away and taking the stairs (with doctor approval) to step your way to success! Eat two freshly prepared meals each week. Some of our healthiest (and oldest) practice members have made it a habit to prepare meals at home with fresh ingredients. We understand that life gets busy and that fast food is cheap and quick, but processed food does not have the nutrients that your body needs. Even service restaurants are often no better than fast food places. For the healthiest food, buy the ingredients yourself (and go organic when possible). Drink only water with meals. We drink a lot of our calories. A 12-ounce can of Coca-Cola contains 140 calories, but there are other sugary drinks with even more calories. Your body needs eight glasses of water each day, and drinking water with each meal will help you reach that eighth glass quicker. Allow yourself a “cheat” meal with juice occasionally to make this resolution easier to swallow. Schedule one chiropractic visit each month (per your doctor’s recommendations). We suggest that a healthy person be adjusted every four to six weeks due to the normal toll that daily life takes on the human body. Each person is different, however, so you may need more chiropractic visits, depending on your health and mobility. Always follow the recommendations of your chiropractic physician. We urge you to invest in your health in 2016; it’s your most valuable asset. Try spinal decompression to combat lower back pain and pain in the extremities, or ask about neurofeedback with BrainCore Therapy to address neurological conditions like insomnia, anxiety, ADHD, and depression. Call (615) 751-0958 today to schedule your next visit with one of our five chiropractors!